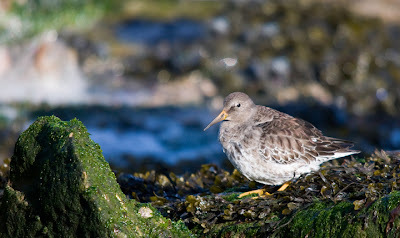 Purple Sandpipers are one of my favourite shorebirds. They are in the top three with Black-tailed Godwits and Curlew Sandpipers. 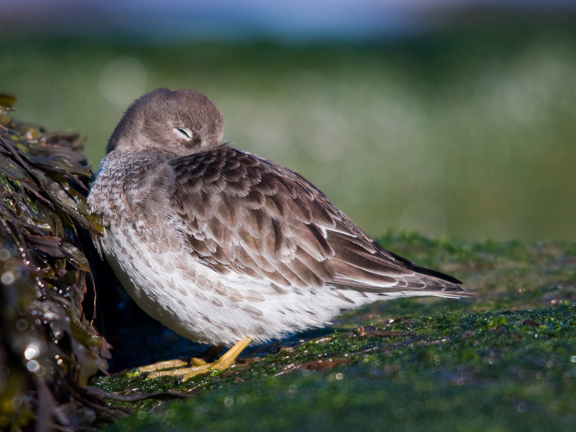 Any opportunity to watch and photograph these cracking little waders is not to be missed. 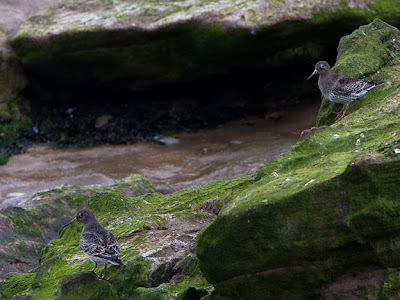 A time-lapse photography project took me to Hilbre Island, a top spot for a Top 3 bird. I allowed myself an hour to get close to a small flock of "Purps" to get a few images for the blog and a slide show I am preparing. I wasn't expecting it to be as good as it turned out to be. I notice one zoom in to the lifeboat slip as the tide starts to recede. It must be hungry, had enough of roosting, it wants to resume searching the seaweed for food. Another sweeps in. It's not been a stunning year for the Purps on Hilbre, the most I have seen at any one time is 8 so I don't expect many more to join this duo. So you can imagine my surprise when another 20 come flying in from the southern end of the island to land right on the edge of the tide washed rocks. A surprise, but a pleasant one. 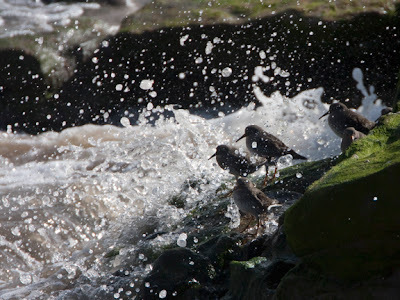 The surf is still breaking over the rocks that they are perching on and the birds are being spattered with foam and spray each time a wave breaks. The waves are really crashing in too, a fierce south westerly wind is touching gale force and whipping the waves up. As the tide drops and more freshly washed seaweed is exposed the birds spread out. 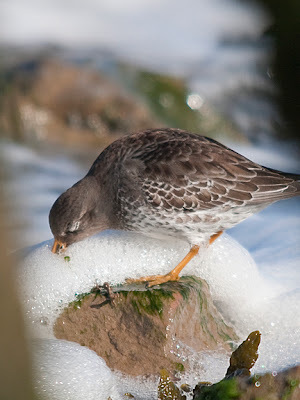 They mooch about the rocks and matted bladder wrack picking at periwinkles and barnacles. 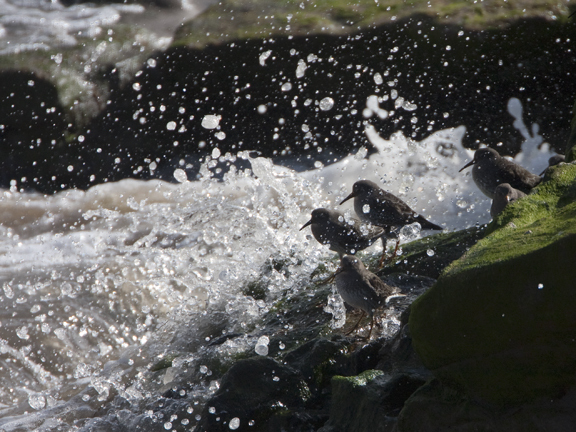 They are right on the edge of the waves and are frequently engulfed by the foamy wash of the crashing waves. This seems to pose no problems for them, the feeding is swift and often successful, not a good time to be a careless shellfish! I decide to slip down on to the rocks to join them. Now I have mentioned before that I dislike it when photographers disturb their subjects but I fancy that I can get close without spooking these guys. I'm right too, I get great close views, almost eye-level and they do not mind at all. They are aware of my presence but are not at all frightened. I am not arrogant enough to assume they have not detected me, nor that they have accepted me, they just seem completely indifferent to me. Truth be told I am being ignored. Suits me fine! Some scurry across the slippy rocks in my direction, them coming to me so I can get a few close ups. One is so unperturbed by me being hunched up on the floor that it finds a sheltered spot behind a rock and goes to sleep. This is turning out to be a special half hour! I run out of space on the camera's memory card so I stop the picture taking and just revel in the sight of 20-odd Purps running around at my feet going about thier daily routine with out a care in the world. 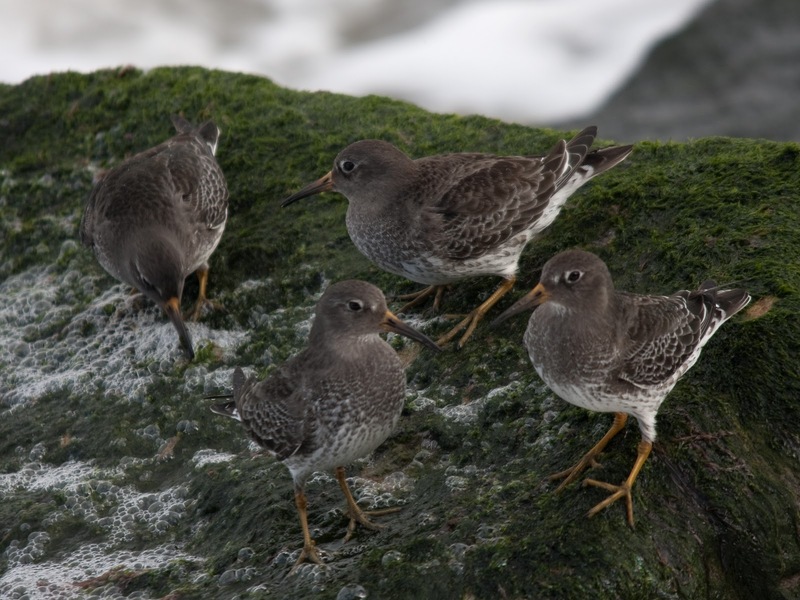 The Purple Sands just went to number one on the wader charts!